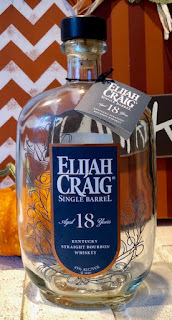 I've been lucky enough to have lucked into finding a bottle of Elijah Craig 18-year at retail for three years running. I can't help but feel privileged in this respect, as it is consistently one of my favorite whiskeys. Here we are in the fall of 2018, now, with this year's set to release soon, and I can only hope to be so lucky once again. In the meantime, however, I finally polished off last year's release, and I think it may be the best one I've had yet! What I've always loved about Elijah Craig 18-year is that noticeable-but-not-overpowering oak note. For me it has always been so well-balanced in this whiskey that, for those who like a little woodiness and dryness in their whiskey, really does that flavor profile well. The nose on this one is soft and sweet. It had a lot of vanilla and honey up front, providing a nice, subtly sweet scent. The dry, woodiness was also immediately noticeable, and that combination of vanilla and wood had me salivating. I also got some rich notes of raisin and even some baking spices, giving a bit of an unsweetened raisin bread note. All of this together provided for an absolutely incredible aroma coming off my glass. In the past with this release, I've found that the first few pours tended to be oak-heavy, but that after having the bottle open for a bit, the sharp edges smoothed out. Here, there was no smoothing out to be done. The oak was right up front with this one, but not in a sharp or abrasive way. Rather, it worked well with a heavy vanilla profile. In fact, I didn't expect to get as much vanilla as I did. It also matched its nose with some rich notes of dark fruit, almost like a pinot noir flavor. However, that dark fruit or wine note was sweetened up with a honey note that also matched the nose. All these flavors combined to create an incredible rich and complex flavor, the likes I haven't really had before, though others have come close. The vanilla sticks around from beginning to end, and lingers for quite a while after each sip. What was nice, though, was an added cinnamon spice on the back end that I really didn't get up front. That, paired with the oak notes I was getting really worked well to counter-balance the sweetness of this whiskey on the back end, and the result was me immediately reaching for that next sip. It's safe to say that each glass I poured from this bottle seemed to disappear faster than most. As mentioned above, for three straight years I've been able to get a bottle of the Elijah Craig 18-year, and this bottle is easily the best of the three. It had everything I look for in a bourbon, and then some--an absolutely fantastic pour! !